Tonight, people all around the world are being encouraged to dim their lights between 8:30 and 9:30 p.m. in recognition of Earth Hour. The international event is meant to raise awareness of environmental issues and climate change. Many businesses are throwing their support behind the movement, and the NHL has joined them. The league has announced an Earth Hour campaign of their own, with all teams hosting games tonight being asked to scale back energy usage in their arena. But apparently that's just the beginning. The league has left the door open for teams to find additional ways to promote environmentalism, and according to sources, several teams have decided to do just that. 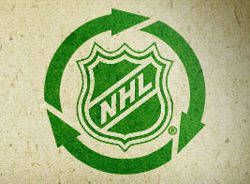 Here are some of the ways that NHL teams will be going green. Columbus Blue Jackets - Will ask Rick Nash if he can take a one-hour break from sitting with his face three inches from a computer monitor while frantically hitting refresh on the Google News page for "Rick Nash trade rumors". Phoenix Coyotes - Have asked the fleet of moving vans that have been circling their arena constantly for four years to pull over and just idle on the side of the road for an hour instead. Los Angeles Kings - Have instructed all of our offensive players to conserve electricity by making sure our side of the scoreboard never changes and ... Wait, did you say Earth "hour"? Oh man, we could have sworn you said "season". Ottawa Senators - Have told the guy who works the goal horn to reduce his output by 50% when the Senators score, since they figure 400 blasts will still be enough to get the point home. There's been an ongoing conversation on Twitter today about the state of Brian Burke's Maple Leafs. I tried to post a short series of tweets on the topic, but Twitter decided that it wouldn't post them all for some reason. So I'm reposting them here. Back to the usual content tomorrow morning. No Leaf fan would have called that acceptable. Not one. Twist it however you want, but you would have called that a disaster. And you'd be right. Have you seen the NHL's new ad campaign? Building off last year's popular series of "History Will Be Made" ads, the league has introduced this year's version: "Because it's the Cup". Pretty cool. You can see more about the campaign here. But there's one problem: Since the whole ad is about the playoffs, the league will end up excluding teams like the Toronto. Or so I thought. It turns out the league is way ahead of me, and has already done a Maple Leafs version. looked while wearing an Oilers jersey. This Sunday is one of the biggest days on sports calendar, assuming you're willing to be generous with your definition of "sports". That's because it's time for another installment of Wrestlemania, the annual pay-per-view event that features the very best that the fine folks at World Wrestling Entertainment have to offer. OK, Wrestlemania may not for everyone. But even if you're not a fan of professional wrestling, the overwhelming hype for each year's production can be hard to avoid. So if you're a hockey fan who's wondering what all the fuss is about, here's a quick guide to get you up to speed on the similarities and differences between Wrestlemania and the NHL. Wrestlemania: If you see somebody wearing a sparkly silver jacket that spells out their name in bright flashing lights, you'll know that Chris Jericho has arrived for his match. NHL: If you see somebody wearing a sparkly silver jacket that spells out their name in bright flashing lights, you'll know that Don Cherry has decided to wear something conservative that night. Wrestlemania: If the crowd yells "What?" every time a person tries to speak, it's because they are using a traditional wrestling chant to attempt to interfere with the villain's train of thought. NHL: If the crowd yells "What?" every time a person tries to speak, it's because the referee is announcing the results of the instant replay review using one of those microphones the league bought at Radio Shack in 1983. Wrestlemania: The fans know that the fights are planned out well in advance, although everyone involved makes an effort to pretend that they're spontaneous and real. NHL: John Tortorella and Peter DeBoer have no idea why everyone is staring at them right now. Wrestlemania: The athletes can often be heard using catchphrases such as "Do you smell what The Rock is cooking" and "I am the Ayatollah of Rock-and-rollah". NHL: The athletes can often be heard using catchphrases such as "We just have to take it one game at a time" and "Like I said, we just have to take it one game at a time". Who will win the Masterton Trophy? stands in an attempt to draw a penalty. The Masterton Trophy is unique among the NHL's annual awards. 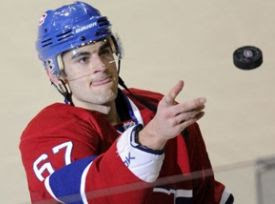 For one thing, it's given to the player who "best exemplifies the qualities of perseverance, sportsmanship, and dedication to hockey", which means it has as much to do with a player's performance off the ice as what he does on it. And for another, it's an award that sees one player from each team nominated instead of the usual three league-wide. Those 30 nominees are announced at the conclusion of voting by each team's local writers, meaning they're spread out over several weeks in March. We don't yet know the names of every player who's up for the honor this year, but most teams have revealed their nominee. Some have made inspiring recoveries from serious injuries, others are being recognized for their involvement in charity, while others have overcome obstacles that threatened their careers. But they all have something in common: each is being recognized for facing adversity in some form. Here's a look at some of the players being considered for this year's Masterton Trophy. Matt Cooke, Pittsburgh Penguins - It's only fair to that he be included, since he was personally responsible for every one of the horrible things that lead to the other 29 guys being nominated. Johnny Boychuk, Boston Briuns - Has often been described as "not completely insufferable" and "somebody you can watch play one entire game without hating, I guess", making him pretty much a unanimous nomination for the Bruins. Curtis Sanford, Columbus Blue Jackets - The veteran goaltender is known for spending most of his time working with the underprivileged, in the sense that he plays for the Columbus Blue Jackets. Joffrey Lupul, Toronto Maple Leafs - Was somehow able to post the best offensive season of his career despite the overwhelming disadvantage of being stuck with a linemate who occasionally doesn't feel like talking to the media. Last week we took a look at the eight teams that had established themselves as the presumptive Stanley Cup favorites. But while it's always fun to look ahead to who'll be left standing after four rounds, some teams have more immediate concerns. As the season winds down, it appears that we have nine teams fighting for the four final playoff spots. The Western Conference features six teams fighting for three spots, including the third seed that will go to whoever wins the turtle derby in the Pacific Division. And in the East, we're essentially looking at three teams fighting for the eighth and final spot. So which four teams will find a way to claim the final spots and sneak into the post-season, and which five will fall just short? Here's a look at the teams that find themselves on the playoff bubble in the season's final weeks. Reason for optimism: Junior sensation Sven Baertschi could potentially return to the roster if a veteran player happened to be injured, if the over-sized anvil dangling from a frayed rope over Lee Stempniak's locker is any indication. Possible bad sign: They'd be overwhelming underdogs in a first-round matchup with the St. Louis Blues, at least if you believe that old hockey adage that "When in doubt, always pick the team that actually retired Al MacInnis's number instead of just honouring it". Reason for optimism: As the current eighth seed will have to find a way to make sure that an opponent doesn't sneak up and get them from behind, meaning they've finally found a subject where they can learn something from Dale Hunter. Possible bad sign: Alexander Ovechkin has admitted that while he initially didn't mind hearing Jets fans chant "Crosby's better" at him on Saturday, it did kind of hurt when we found out afterwards that the Crosby they were referring to was Bing. Reason for optimism: Ownership is so confident in the team's chances that they've already got a detailed parade route hanging in the board room at team headquarters. Possible bad sign: Well, we're assuming it was a parade route, although come to think of it maybe it was kind of odd that it starts in Glendale and winds up in Seattle. We don't know where most of the NHL's awards will go when the hardware is handed out in June, but we can probably go ahead and engrave Steven Stamkos's name onto the Rocket Richard Trophy for the league's leading goal scorer. 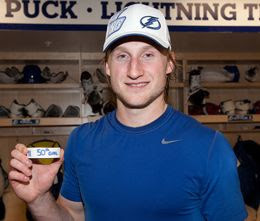 Stamkos recorded his 50th goal of the season earlier this week, reaching the magic number before any other player could even get to 40. Stamkos may end up being the only player to score 50 this season, but he'll have plenty of company in the history books. Although the feat has become less common in the current era, 90 different NHL players have managed the reach the 50-goal milestone at least once in their careers. Here's a look at some of the past and present stars who've managed to join the prestigious 50-goal club. 1993 - Brendan Shanahan scores his 50th goal of the season, then quietly admits to himself that he's not sure that was really the right number and resolves to start randomly scoring less or more without any explanation. 1991 - Brett Hull scores 86 goals and marks the start of a decade in which he's so unstoppable that he sometimes seems to be playing under a completely different set of rules, Sabres fans will later notice in hindsight. 1989 - A career-high 70-goal season from Bernie Nicholls results in the league reluctantly rescinding its controversial "Just to make it fair for everyone else, from now on Wayne Gretzky assists only count if he ricochets the shot off of Bernie Nicholls' head" rule. 1998 - Traded to the Flyers following several disappointing seasons in Montreal, John LeClair records three straight 50-goal seasons after finally being able to explain to an English-speaking equipment manager that he would actually prefer to use left-handed sticks. 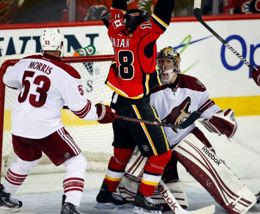 We're heading down the homestretch of the NHL season. Every team is down to their final fifteen games or less, the playoff races are tight, and we're starting to see some separation between the contenders and the pretenders. While most of the league is either battling for the bottom playoff seeds or already looking toward the offseason, a handful of teams have begun to separate themselves from the pack. 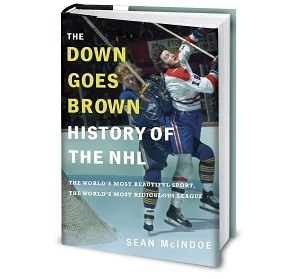 And while it's always possible that we'll see a Cinderella run from an underdog, history tells us that when the Stanley Cup is eventually handed out in a few months it will go to a team from the top of the regular season standings. So let's get to know a few of those teams. Here's a closer look at the eight teams that look like they'll be heading into the postseason as the Stanley Cup favorites. Greatest strength: The returning Sidney Crosby won't need to worry about being reinjured by an opponent's body check this time, says Gary Bettman while sitting calmly in the rafters holding a sniper rifle. Potential weakness: Opposing penalty killers can expect an easy time of it when facing the combination of Crosby and Evgeni Malkin, since the powerplay will only ever last six or seven seconds max. Greatest strength: Lead the league in goal differential with a +58, although in fairness that does go down to +3 if you take away their five games against the Maple Leafs. Potential weakness: Are starting to get a bad feeling that they misunderstood Tim Thomas when he personally assured them that he'd make sure the whole "refuse to go to the White House after winning a championship" incident would never happen again. over on his way to the nearest exit." It’s been a tough few weeks for NHL coaches. Ron Wilson, of course, lost his job after failing to pull the Maple Leafs out of their recent tailspin. Wilson brought the season’s total for coaching casualties to eight, which would be bad enough. But lately it seems like any coach who isn’t being sent to the unemployment line is winding up the injured reserve instead. San Jose coach Todd McLellan missed several games with a concussion after being hit in the head with a stick. He finally returned to the Shark’s bench on Tuesday for a matchup against Edmonton Oilers coach Tom Renney, who is coming off his own recent concussion thanks to an errant puck. 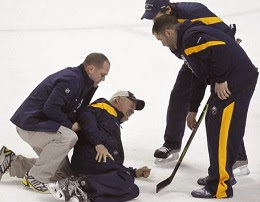 And let’s not forget Sabres’ coach Lindy Ruff, who suffered broken ribs in a collision during practice. It would be tempting to say that any coach who’s managed to avoid getting injured or fired must be doing pretty well. But apparently not, since according to my sources plenty of other coaches are also having a rough time of it. Here’s a sampling of some other recent coaching complaints. Mike Yeo, Minnesota – Now realizes that when he spent all that time teaching the forwards how to properly slide along the ice in an attempt to block a shot, he apparently should have also told Devin Setoguchi that he didn’t need to do it on his own shootout attempts. Randy Cunneyworth, Montreal – Hasn’t had time to make much progress on learning French lately, which is too bad because it would have really come in handy next year when he’s coaching in Belgium. Peter DeBoer, New Jersey – Feels like his first season with the Devils has gone pretty well all things considered, so not really sure why his desk calendar for the first week of April says “help new coach move in to office”. 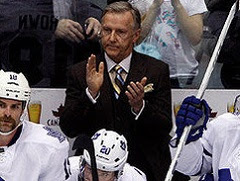 After weeks of speculation, Ron Wilson was finally relieved of his duties as head coach of the Maple Leafs on Friday. The firing spelled the end to a mostly disappointing time in Toronto that was marked by poor special teams, sloppy defensive play, and a failure to get the team back to the playoffs. By the end, fans at the Air Canada Centre were chanting for him to go. But was Wilson really the problem in Toronto? Based on his resume, it doesn’t seem likely. Many of his critics in Toronto seemed to forget that Wilson is one of the most successful coaches in NHL history, ranking in the top ten for career victories while coaching somewhere every season since 1993. It’s too soon to say whether we’ll ever get another look at Wilson behind an NHL bench, but history suggests we may not want to count him out just yet. In the meantime, let’s take a fond look back at some of the notable moments from the long career of Ron Wilson. September 14, 1973 - As a freshman at Providence College, Wilson begins to wonder why his annoying roommate spends all his spare time reading the thesaurus and practicing undoing his necktie. June 3, 1975 – Wilson is picked by the Maple Leafs in the same draft that also sees Toronto select Bruce Boudreau and Ken Holland as part of the team’s patented strategy of focusing on players who have demonstrated keen intelligence and excellent leadership and zero ability to actually play hockey. 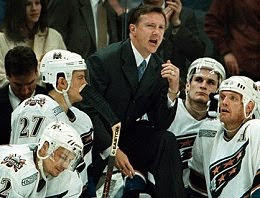 June 29, 1993 – The expansion Mighty Ducks of Anaheim make Wilson the first coach in franchise history, leading to a four year stint that he’ll later describe as enjoyable once you can get past every single kid you meet walking away muttering “Wow, Gordon Bombay did not age well”. no longer worked as well as it used to. It’s getting ugly in Toronto. After a strong first half, the Maple Leafs have been in a tailspin lately, and will enter tonight’s game having won only one of their last 11 and fading from playoff contention. Fans are unhappy, chanting “Fire Wilson” at one recent home game and lighting up phone-in shows and web forums with demands for a change behind the bench. Apparently, Brian Burke agreed. The Leafs general manager fired Wilson on Friday evening, ending weeks of speculation during which he’d repeatedly told reporters that he wasn’t contemplating a coaching change. On the one hand, Wilson is one of the most successful coaches in NHL history, and he was never given an elite roster to work with in Toronto. On the other hand, somebody had to take responsibility for the plunge in the standings, and Wilson turned out to be the guy. Was it the right call? It’s tough to say. Here are some of the pros and cons Burke was no doubt considering this week while deciding where to pull the trigger on a coaching change. Pro: A new coach would be given a honeymoon period by local fans and media where his every decision wouldn’t be immediately subjected to kneejerk criticism, and if he plays his cards right he could probably get it to last for almost the entire introductory press conference. Con: It would be difficult to make a change now that the trade deadline has passed, since we’re pretty sure the league has a rule this year where any team that wants to fire its coach has to go out and acquire Tomas Kaberle first. Pro: Don Cherry has been criticizing Wilson for years, and it would be nice to see a humble guy like that finally be able to take credit for being right about something. Con: Wilson is a highly respected veteran who other coaches go out of their way to observe and learn from, we assume, since it would explain why Randy Carlyle has watched the last few Leaf games from the seats behind the bench while wearing a fake moustache and glasses.